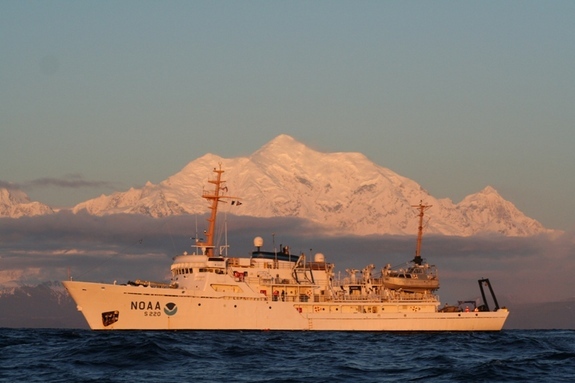 NOAA Ship Fairweather in the Gulf of Alaska with namesake Mt. Fairweather. The waters off the Pacific Northwest are becoming more acidic, making life more difficult for the animals that live there, especially oysters and the approximately 3,200 people employed in the shellfish industry. Researchers from the National Oceanographic and Atmospheric Administration (NOAA) will set sail Monday (July 29) on a monthlong research cruise off the U.S. and Canadian West Coast to see how ocean acidification is affecting the chemistry of the ocean waters and the area’s sea life. Ocean acidification occurs when greenhouse-gas emissions cause carbon dioxide to accumulate in the atmosphere and become dissolved in sea water, changing the water’s chemistry and making it more difficult for coral, shellfish and other animals to form hard shells. Carbon dioxide creates carbonic acid when dispersed in water. This can dissolve carbonate, the prime component in corals and oysters’ shells. The world’s oceans are 30 percent more acidic than they were before the Industrial Revolution, scientists estimate. That expedition linked more acidic waters to huge declines in oyster hatcheries, where oysters are bred, Warren said. Oyster farms rely ona fresh stock of oysters each year to remain economically viable. When the data came in from that cruise, it was “a huge wake-up call,” Warren said. “This was almost a mind-bending realization for people in the shellfish industry,” he said. The new cruise will also look at how acidification is affecting tiny marine snails called pteropods, a huge source of food for many fish species, including salmon, said Nina Bednarsek, a biological oceanographer with NOAA’s Pacific Environmental Marine Laboratory. The research will take place aboard the NOAA ship Fairweather, which will depart from Seattle before heading north and then looping back south. It will end up in San Diego on Aug. 29. During this time, scientists will collect samples to analyze water chemistry, calibrate existing buoys that continuously measure the ocean’s acidity and survey populations of animals, scientists said. The researchers will also examine algae along the way. Ocean acidification is expected to worsen harmful algal blooms (like red tide), explosions of toxin-producing cells that can sicken and even kill people who eat oysters tainted with these chemicals, said Vera Trainer, a researcher at NOAA’s Northwest Fisheries Science Center. Email Douglas Main or follow him on Twitter or Google+. Follow us@livescience, Facebook or Google+. Article originally on LiveScience.com. This entry was posted in Environment, Health, Top Story and tagged coral, environment, greenhouse gases, NOAA, Ocean acidification, Pacific Northwest, Pacific Ocean, shellfish by admin. Bookmark the permalink.